Perhaps because of the long weekend, or perhaps just because the stars were perfectly aligned, we received a record amount of fun deliveries at the workroom on Tuesday. Each of our delivery guys – UPS, Purolator, Fedex, Canpar and Canada Post paid us a visit bringing boxes filled with Japanese fabrics, sewing notions, organic cotton canvas and a stack of the first issue of Uppercase Gallery’s magazine. Everything that Uppercase Gallery does is delightful, so it was a pretty sure bet that their magazine would be a keeper. Oh, it is. From the cover illustration by Blanca Gómez to the tear-out artwork by Charlotte Sullivan at the back, the magazine is filled with wonderful features on Irina Troitskaya, Great Lake Swimmers (one of my favourite bands), and me! It was such honour to be asked to be a part of this project. 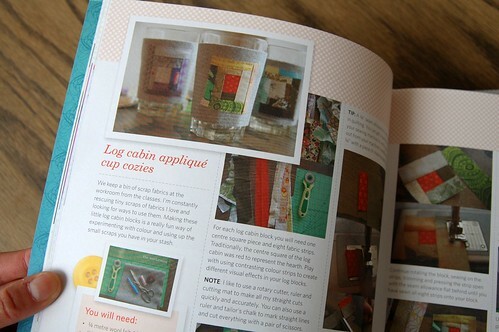 You’ll also find a fun tutorial for Log Cabin Applique Cup Cozies that I worked on just for the magazine right after my interview. If you’ve ever been to the workroom, you’ve surely had a cup of tea with one of these cute cozies on your cup. Now you can make your own! To celebrate the launch of this ‘magazine for the creative and curious’, I’d like to give away a copy to two lucky readers. Just leave a comment revealing something you are curious about these days. For me, it is honey. I’d like to start collecting honey from around the world and learn to discern its different flavours. I’ll close the contest by Friday April 17 at midnight and announce the winners (randomly chosen) on Monday. With so many of our favourite magazines folding, I hope you’ll support this beautiful Canadian magazine. We have copies here at the shop, or even better subscribe! I’m curious about so many things all the time… but these days I’m really curious about getting to know my camera better, understand the settings and specifically how to take product shots. 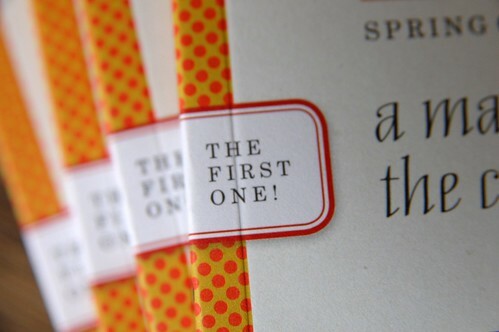 I love Uppercase and follow their blog. They have the neatest contests. I’m very curious about ‘teams’ right now. How can you take a random group of people, all with their individual talents and build a synergistic team. I know it sounds like boring business school or something but the psychology behind human interaction is just so fascinating! I am curious why some collage art appeals to me and some doesn’t. It seen the ones I like have much in common (that is they look similar) but I can’t quite figure out what it is. I’m curious about opening up my own business either Etsy, online or brick and mortar. For now I’m just cruising blogs and stores to see what it’s like. These days, I’m curious about CSAs (Community Supported Agriculture) and eating local. Karyn, looking forward to the Hunt & Gather trunk show this weekend! Right now I am wicked curious about birds. I live near a bird sanctuary in norther California and I have tons of birds and nests of all kinds in the trees near my house. Driving my puppy crazy! I am seriously curious about Snickerdoodle Cookies. I’ve had many failed attempts to make these darn cookies. Probably one of the not so popular cookies for people but I had them once and I can’t make them. If anyone has thee perfect recipe, do tell! I love that this is a Canadian production. Everything about it looks so fresh. What am I curious about lately? Well, my dad is sick in the hospital with a nasty case of pancreatitis so I’m all about learning how this little organ ticks. Can I join in the drawing too? 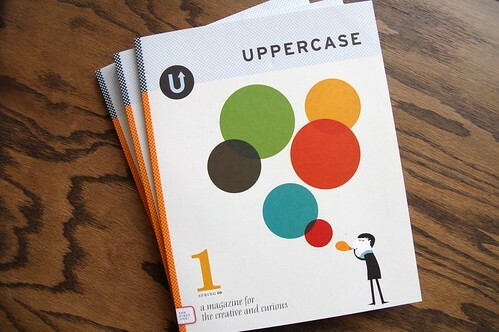 I live in the USA and have no idea if I could find Uppercase magazine in a bookstore. I am curious about starting seeds for my garden and maxizing the results without buy lots of equipment or growlights or heat pads. I am also curious about setting up a rain barrel and a drip irragation system using the rainwater. Oooh, looks like a nice publication!I’m taking printmaking course, which has piqued my curiosity of paper – I would love to learn how to make paper using organic or recycled sources. WOW!!! This looks like a FABULOUS new magazine and being a Canadian one is another WOW!!! I’m curious about the evolution of tastes or what appeals. It really seems kinda strange that things I hated as a kid suddenly are awesome now that I’m older. Like broccolli, I used to absolutely hate it but now I’m in love with the little veggie. Oh! I wish I lived closer so I could come to your store. I am curious about medicines, do we really need them or is there an alternate way to go about health? A magazine for the creative and curious – I love it! I also love to enter contests. So it seems as though the stars are aligned for me to throw my name into the ring for this one. So here goes. Now, as for what has piqued my curiosity as of late, it is…dancing. I am an awful dancer, I dance like I have no feet (not two left feet – no feet). I have always wanted to learn how to dance and wonder what makes a good dancer, is it natural or taught or both? weirdly enough, lately i have been curious about radiation oncology! i am working in this dept. for a temp job and i am interviewing doctors, residents & scientists for a publication. at first i was just going through the motions, but as the puzzle pieces begin to fill in, i am becoming really interested in knowing more. i feel like my brain is getting exercised in a very different way than usual, and it feels good! so glad to know about this publication, by the way. everytime i pop by uppercase’s site it seems they have something awesome going on. inspiring. I’m curious about associations – how one thought leads to another, and how you can end up at a place rather different than you had started. And, of course, curious to check out this magazine! Hopefully there will still be copies left at Hunt & Gather. I am curious about other people’s strategies for accomplishing all the items on their Spring TODO lists. I never seem to tackle all the goals on mine. This magazine looks rad– can’t wait to look at it in the shop. This magazine looks great and so thanks for this contest! See you at the trunk show on Sunday! I am curious about paper piecing when sewing quilts. Just can’t wrap my head around it! This magazine looks wonderfilled. This is great – I love that it is Canadian made – so great!!! I want to let you know I just came across this blog yesterday and spent literally hours perusing this blog and your store website. The Workroom is like a dream I have had in my head – I hope to one day have similar store in my hometown. Thanks for all the inspiration. neat! this looks like a very fun magazine, thanks for sharing! I’m curious about creativity. As much as I’ve read about it, it seems a very individual proposition. Many creative individuals have advice, but ultimately their suggestions are specific to their individual situations and personalities. Nevertheless, I’m fascinated with their stories and love learning about how others nurture creativity. I’m curious about my new mandolin…the slicing kind, not the playing kind. What vegetables can I crinkle cut or slice into fries! I would love this new magazine, thanks for posting! yay! karyn! superstar!!! i want one. i am curious about YOU. and what would have happened to My So Called Life if it made it past 19 episodes. These days I am particularly curious about… plumbing. Yup, pedestrian but you asked. Other than that, I am always working on my art. Thanks for the giveaway. At the moment I am very, very curious about photo styling, especially product and prop styling. I am trying to learn it by myself by practicing a lot! Wow, I love those new fabrics, and usually I don’t like printed patterns on white! Lately I’ve been curious about pancakes. The New York Times prints some great recipes, including one for really dense Swedish pancakes that I’d like to try. A departure from standard buttermilk pancakes. ooh, that magazine looks lovely. TI’ve never heard about Uppercase but that magazine just looks fantastic. HI! I think there’s another Venus that you know. I’m the one from San Diego! Hi, again! I’ve been curious about dreams. I’ve been having some pretty interesting ones lately. Looks gorgeous and perfect for sinking into the next time I get a couple uninterrupted hours. Coffee with a friend this morning left me particularly curious about curiosity and how and why education seems to dull it rather than stimulate it. These days I’m curious about the link between parent and child. My eldest is being graded in karate for the first time tomorrow. It feels like school presentations all over again. She’s terrified and so am I. Why is she so like me and how come this one thing is reviving in me feelings I’ve been suppressing for years. Looks great! I’m curious about a lot of things. Like why my 10 month old decided he has to yell at the top of his lungs to get his way? How do they learn these things? I’m super curious to see this magazine in person! Right now I am curious to find out if customs will let me post you some NZ honey for your collection…I am also very curious about homemade ravioli and am becoming a bit obsessive in my experimenting. oh, i like uppercase. and love that you got to be a part of their first magazine. whoohoo. and the cozy looks perfect! hmmm. i am curious about the near future. in a year or so. what our life will look like in canada opposed to our life in japan now. curious. and excited! Oooh…LOVE honey! We attended a honey tasting a few years ago and it was divine! I’m curious about yoga and wellness lately – trying to get myself back into shape and am investigating all sorts of options there. The magazine looks amazing – what a great thing to be a part of! finding uppercase in my mailbox would make the encounter so fun! I bought a silver grey shirt from a thrift store that I’d like to re-fashion. so I’m curious to learn what needles and thread are appropriate for this fine material. Ohhhh! 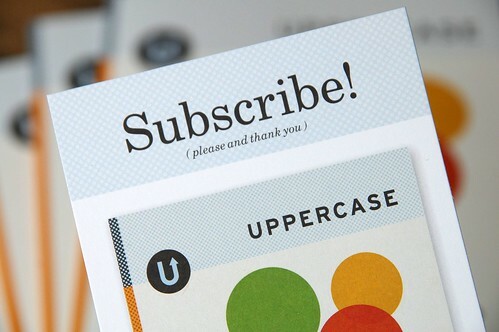 I’ve been seeing lots of good things about uppercase magazine. It looks magical, to say the least. I’m curious about Japanese folk tales. I watched My Neighbor Totoro last night and I want to know whether most of it was made up or had a basis in folk stories/fairy tales. I am curious about needlepoint. I made a pin cushion in grade four (ten years ago) and with mother’s day coming up I would love to get back into it. I am also curious (your honey curiousity made me think of it)what makes maple syrup organic?! i am curious about home improvement related things. this summer is gonna be filled with hard work! oh so excited!! Hmmm…. I am pretty curious about a lot of things. But I have been especially wanting to learm how to sew! I have only ever made plain simple pillow cases and would love to learn more to start making lovely clothes, home furnishings, etc. The magazine looks lovely, I can’t wait to check it out! p.s. Karyn – I collect honey! And there’s a huge difference in taste. You should definitely get a bottle of tupelo honey – rare and very strong. Oh, and grab some honeycomb – it’s the freshest taste! I’ve been curious about a very unanswerable question: how much coffee is brewed in new york city each day, in gallons? 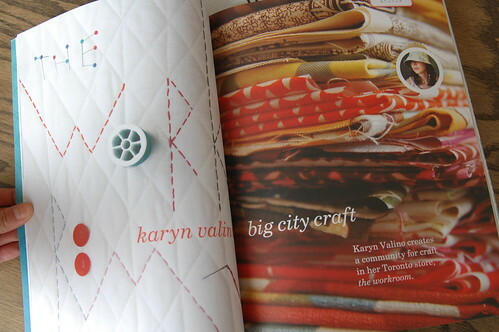 i loooove it karyn…and i love how you were part of the magazine! i might just suscribe…the pictures are wonderful! that looks like such a great magazine, and how thrilled I’d be to win a copy! It’s just starting to be spring here in VT, so right now I’m curious (as I am each year) about bulbs… I planted a bunch last fall and it’s so fun to see the green start to come through the ground. I really find it amazing. Wow, I hope that you will still have copies available when I visit! I met a lady over the Easter weekend who lived in my house over 60 years ago when she was a teenager, so I’m really curious to do some research and find out more about my neighbourhood and my house. Sorry I only post when you give something away! I’m curious about silk-screening….and can’t wait to start playing around with printing. But it will have to wait for a while yet…. I was hoping this would be available to purchase locally! Can’t wait to see it. I am curious about why cat scratches sting the skin – do they have venom in their claws? I am also curious about the evolution/devolution of the fitted garment and how we can make dresses that are structured like a fine piece of architecture fashionable once again. i’m interested in terrariums lately. i am slowly but surely putting one together (with little plastic mushrooms! )the magazine is lovely!! Ooh,sounds such a inspiring magazine. These days – i’m curious about diy wedding projects – trying to make all sorts of fun things for my wedding in Sept.
Magazines, old ones, new ones, craft magazines, decoration magazines…This is what I miss most from Canada….This one looks really interesting. Too late for the contest (this is what happens when you live on the other side of the planet ;-)), but still these days I am curious about vegetarian cooking (using vegetables from my garden), especially since I discovered that website: http://www.101cookbooks.com/. Really inspiring. what a wonderful journal! thanks for the introduction! i’m curious about egg yolks. what happens to the egg yolks that get taken out for egg-white omelets and those cartons of egg-white extracts on the supermarket shelves? somebody somewhere must be getting insane levels of cholesterol these days. these days i’m curious about hand-sewing. i’ve only ever machine stitched, but i am loving the hand-sewn look and am considering giving it a try. don’t know if i have the patience, tho’!